1. The cage drive system is equipped with buffering device, so the cage moves more stable. 2. The ergonomically designed cage interior improves comfortableness. 3. The unique structural design has applied for patent. 4. The typical technologies ensure the malposition difference of the guide rail. 5. The excellent parts in the industry ensures reliable quality of the machine. 6. Precise assembly and accurate drive. 7. Professional solutions for special projects. 8. The complete safety devices ensures reliable control system. SC series product also has special design, such as reinforced guide rail with cross-section of 800mm, inclined type, special for cooling tower, etc. 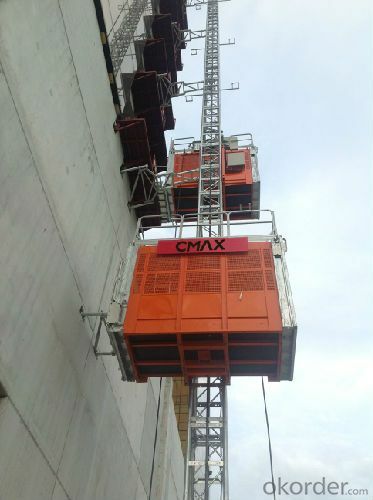 All the double cage construction elevator can be changed into single cage type, such as SCD200. Note: Both cage size of 3×1.3×2.2 and 3.2×1.5×2.4 are available for of each model (Excl. export type). Q: What is the dimension of the cage? A: Normally the cage dimension is 3X1.5X2.5M (L/W/H) for 2t type hoist. Details should be checked according to our quotation sheet. Also, the size can be customized according to the factual site condition. There are two doors (entrance & exit doors) for each cage, It can be produced as up & down sliding or ramping model for safety and convenience.